July 4th, 2018 (9:15 PM). 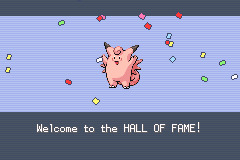 - The hardest part was definitely the beginning, with Ekans having very limited moves. It asked for a lot of patience, which I don't always have (and therefore I procrastinated this project for a few weeks). 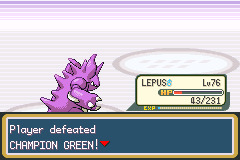 I beat the E4 in one go, even though NAJA was close to fainting a few times. July 8th, 2018 (9:16 PM). Edited July 17th, 2018 by Suon. 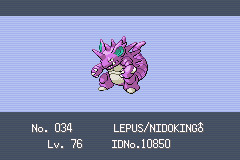 - The E4 was easy, but Champion BEIGE's Rhydon suddenly OHKO'd APODEMUS. At the second try, I set up 6 Double Teams against his Pidgeot before facing Rhydon, and succeeded. - TACHY lost almost every match against rival INDIGO, except the final Champion one. 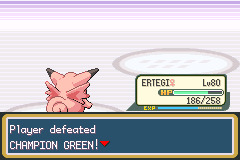 - The E4, including Champion INDIGO, was very easy, using one X Attack in each battle. July 21st, 2018 (5:24 PM). Edited September 6th, 2018 by Suon. This was a fairly easy run, from start to finish. Had good coverage moves, although I did almost faint against Lorelei's Lapras. Even forgot to buy X Items, but didn't need them. Same as with the Nidoqueen, this was an easy run. Only Rival Green's Gyarados gave me trouble by hitting Hydro Pump five times in a row. Keep on healing until the PP runs out always works though. Also, didn't forget to take screenshots for a change. Try to make them with all upcoming runs from now on. August 10th, 2018 (1:19 AM). Holy Arceus it's been way to long since I've done anything challenge wise. I finally beat Alpha Sapphire part for the Houndoom Ultimate. Special mention to Steven for the strat being hope Aggron misses Stone Edge because it has Sturdy. September 6th, 2018 (9:37 PM). Wow! The very first time I ever used a Clefable, and what a beast she can be! She doesn't learn many useful moves herself, but can be taught many. With Ice, Electric and Psychic moves, all of the E4 and Rival Pokes are covered (except for Jynx and Alakazam, but I chose Calm Mind over Shadow Ball). September 22nd, 2018 (8:28 AM). Tychus Findlay: We spent a lot of time huntin' down all them pieces. Now 'it's all together, this thing gives me the willies somethin' awful. Jim Raynor: I know what you mean. When I look at it, it's... it's like I can hear voices in my head... Sooner we're done with this thing, the better. General Warfield: Agreed. Right now this artifact is the most important weapon in the universe and we're going to use it. Tychus Findlay: I just wish the damn thing came with an instruction manual. For all we know we could be upsettin' the entire space-time continuum! Jim Raynor: Easy, Tychus. This ain't science fiction. September 30th, 2018 (6:53 AM). While I almost exclusively play hacks/QoL mods I feel like I shouldn't be excluded, so here's things. ... I will never solo any Dark Rising game again. I haven't struggled that much with the E4 anywhere. Not even in Vega. 3 Weeks Ago (2:24 PM). I've been debating doing this for quite a while and whilst I have other unfinished challenges, this one in particular is really nagging me and I feel like I need to do it. I legit don't even know if it's possible but I'm assuming it is.